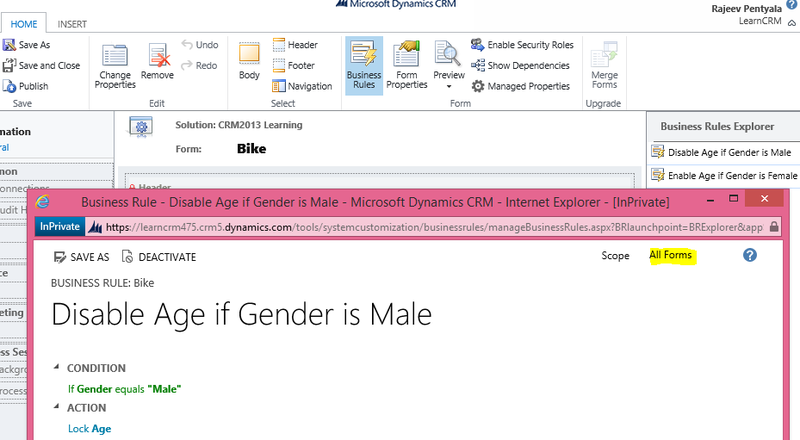 ‘Quick Create’ form is the latest addition in CRM 2013 new set of features. ‘Quick Create’ form enable you to create records quickly by just filling the key information (i.e., fields) using global ‘Create’ button. To enable ‘Quick create form’ for an entity, you have to check “Allow quick create” check box under Data Services in entity properties. Quick form only contain one Tab and three Section , we can’t add new tab or section. To enable ‘Business Rule’ to work on ‘Quick Create Form’, we just need to set the scope of ‘Business Rule’ to ‘All Forms’. I will keep adding few more points, if I come to know.